The Word Poonai (pronounced Poo Nye) means a cat in Tamil language. 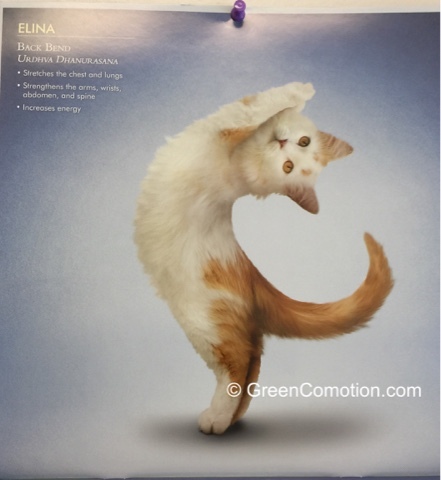 I saw this cute kitty in a calendar at the doctor's office a week or so ago. it certainly got the moves!! Have a wonderful weekend. Indeed...VERY cute. Of course, I'm partial to kitties!! It is so cute cat! Cats and cat calendars are fun! Hello, I wish I could move like that. Cute cat and calendar. Thank you for linking up and sharing your post. Happy Saturday, enjoy your weekend! Cute pose by the cat. How cute! Enjoy your weekend! We should all be as flexible as that kitten! Sweet! Very cute! Reminds me I must try to go to yoga class tomorrow. Can't compete with your sweet kitty, but s/he inspires me to preserve what is left of my flexibility. Peace to you as well! She's got the pose down perfectly. Cat Yoga is always fun to watch - spent the last few days in the company of a kitten - very good at yoga!